Courtesy of Whispers from the Soul Facebook page. 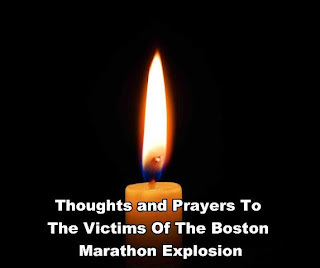 I woke up this morning, here in Malaysia, shocked to learn of the bombings at the Boston Marathon. Boston, as some of you may know is my adopted home town. I could not believe that this could happen in my favorite city. Boston hosts many large entertainment and sports events which have extremely tight security and has never had an incident. The Boston Marathon is attended by hundreds of thousands of people from all over the world. People line the streets to cheer on the runner, even though they are from every country of the world and residents who live along the marathon route, which goes through the Boylston Street and Copley Square area, hold parties on their balconies and rooftops celebrating the marathon, spring and Patriot's Day, a holiday in Massachusetts. It is a proud day for Boston to celebrate life, sports and freedom, in a joyous and lively way. I look at this tragedy first with shock and then sadness as I wait to hear that my friends are well and safe. I still can't imagine that someone did this to my Boston. Now that I have been watching on CNN, as the events and investigation unfold, I not only feel sadness, but I feel anger toward the person or persons who are responsible. Why would they take an event that celebrates life and kill and main innocent people? What does killing an 8 year old boy do for you or your cause? This just proves that these people have absolutely regard for human life. As the photos, videos, and stories of what happened emerges I feel a sense of pride for my fellow Bostonians and for people from all over the world who lent a helping hand during this tragedy. The EMS, policemen and firefighters who were prepared to handle sprains, strains and dehydration, quickly changed gears to deal with death and life threatening injuries as a result of two bomb blasts. All of the hospitals in Boston mobilized to handle all of the injuries, as wave after wave of ambulances came to their emergency rooms. At the disaster site ordinary people, as seen on the news, did what they could to care for the injured. Bostonians are a very proud and tough people who will meet this tragedy head on and will come out stronger than before. The Boston Marathon will also recover and be back again next year for the 116th time. In the coming days we will hopefully find out who is responsible for this carnage and what their reasons were. They eventually will be caught and brought to justice for their cowardly acts. The residents of Boston will go on with their lives as usual and the rest of us must go on also, so as not to let these terrorists or any other types of violent groups intimidate us. We cannot let them win. Please pray for Boston. If you would like to see some fantastic photos from Boston.Com please click here.